As the warm summer temperatures fade into falling leaves and longer nights, it becomes more and more critical for agents and home sellers to market their properties aggressively. There is no time like right now to reach out to your clients, or those who you would like to be your clients to remind them you are here to help them in that endeavor as well as have some fun in the process. You have heard the term “out of sight, out of mind” but did you realize that this same principle applies to your business? The latest marketing piece from RockPointe Marketing is a fun, attention-grabbing Halloween themed postcard that can be printed and mailed inexpensively. This piece is a great way to keep your clients thinking about how your professional photography, savvy marketing, and virtual tours, help them to sell listings quickly and for more money. 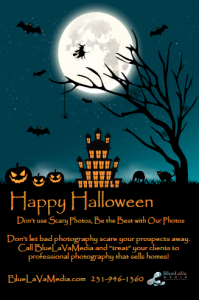 This standard size postcard features a fun message reminding them that bad photos “scare” clients away, and professional photography sells homes. The backside lets the reader know that you offer powerful marketing services such as Aerial Drone videos, Zillow Video Walkthroughs, 3D VR Headset Tours, Virtual Home Staging and more. If you don’t offer all of these services you have the flexibility to customize the list or eliminate it altogether and add a handwritten note. Anytime you send a personalized piece to clients or potential clients you are creating a “touch point” that cements your professional relationship and keeps them thinking of you when they need photos of a property. This piece is available as a Photoshop or Illustrator file which RockPointe Marketing subscribers can download, customize and send to clients one at a time, or as a full mailing campaign. Add your own logo, contact information and personalize the message any way you would like. These marketing pieces give you the flexibility to carefully craft your own message or market your business quickly by simply adding your information and sending the files to the printer. Halloween is approaching fast so log into RockPointe Marketing today to download your copy. Not a RockPointe Marketing member? Reach out to us today and ask how you can take advantage of the many benefits RPM has to offer.